As you sit at the gate, sipping your soda and looking around at the passengers mulling about with some gloom, you are probably witnessing the glum that comes with flying on regional jets. These are not the happy and excited travellers flying to Europe. These are the either the uninitiated masses flying-off to see Aunt Gladys in Dayton, or the business traveller struggling to get home from that sales meeting in Baltimore. It’s those short-haul flights, with those puddle jumpers, that tend to wear on people. To state the obvious, I feel that this comes from a few main reasons: regional planes tend to be delayed owing to the compounded delays and conditions across having to fly multiple routes a day, small cramped cabins, often needing to take a bus out to the tarmac as opposed to a gate-ramp, poor leg room with cramped seats, bumpy rides, and finally (worst of all) gate-checking your bag. Honestly, it’s like taking a bus, and that’s no fun. I have flown on a relatively small number of regional jets. The US Airways, Air Canada and United Airways Bombardier CRJ200, the Air Canada Bombardier Dash8-300, and even a Beechcraft 1900. I can almost excuse the prop-planes from any critique, since when you’re on such a short, low capacity flight, you’re not going to expect much. Also, some airlines have done-up the prop plane, such as the Porter Airlines Q400 planes – which take it in an opposite direction: design for luxury. The Air Canada Embraer E175 is a rare exception to all this. I will actually go out of my way to fly on this airplane, and its current configuration has been around for years – this is not something new. The E175 offers a 70+ seating capacity airplane with a pretty decent sized cabin that alleviates the problem with gate check since the overhead bins are big-enough to fit your carry-on (albeit length-wise). This is a huge plus. A huge plus. Can you tell I hate gate check? Is there anything worse than standing on the tarmac at Dulles waiting for your bag in January? This jet is still a 2+2 configuration, which is actually pretty comfortable – not having a middle seat is always a plus. The aircraft cabin noise levels are typical for this kind of aircraft, and it’s not noticeably noisy – my impression is that it is quieter than most in this class. The leg-room is pretty good, as well. I never feel too cramped. Air Canada offers in-flight entertainment on every seat in their E175s. This is pretty unique, as even the new United and American E175s don’t offer this. Also, they have a power outlet in every row, along with a USB charger for every seat in economy class. This is immensely useful, and I can’t imagine any airplane not offering power for charging these days. 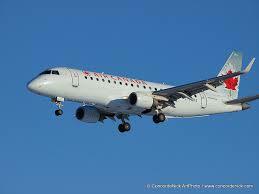 Air Canada offers a business class service on this flight with nine (9) business class seats. This might seem unnecessary, but there’s something to be said about snagging your upgrade after a few days of travel on your way home. Yes! Interestingly, Air Canada runs this plane on both short and long routes, from hour-long flights to the north-east, for flights up to four (4) hours. I was stuck on multi-hour flight from Denver to Chicago on a United CRJ200, and that is not comfortable. I recently had to book flights to Denver on United, and I was pleased to see United offer service on an E175 at a time that was convenient for me to travel – it was an easy choice over the CRJ200s at the other flight times. Carry-on fits in the overhead bin. Thank the Lord. The bottom-line: If you have multiple flight options and have a chance to ride an E175, go for it. ← What’s Summer without Clean Rims?